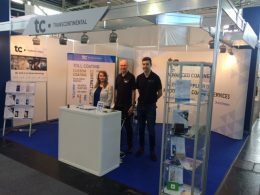 Wrexham, March 27, 2019 – Transcontinental Advanced Coatings recently exhibited at ICE Europe 2019, held in Munich, Germany. ICE Europe is one of the leading exhibitions relating to the coating and converting of paper, polymeric films and foil. A total of 7,150 visitors from 25 countries attended; this is a 4% increase on the previous event and these numbers clearly express the popularity of this global show. Transcontinental Advanced Coatings, who joined 463 exhibitors to promote their products and services have been regular exhibitors at ICE Europe for many years. The exhibition provides Transcontinental Advanced Coatings with an excellent forum for showcasing its custom coating expertise. Transcontinental Advanced Coatings is a global leader in the development, manufacture and distribution of precision coated papers, films and speciality substrates for electronics, medical and optical technologies. The company also offers unique speciality films and coating services, including contract coating, toll coating and converting. Transcontinental Advanced Coatings attended the show to promote its contract coating (toll coating) services. The company also discussed its complete design and manufacturing capability. Many clients engage with Transcontinental Advanced Coatings to develop opportunities from small scale laboratory coating through to full scale production.